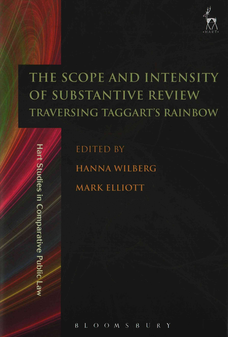 Co-edited by Hanna Wilberg and Mark Elliott, The Scope and Intensity of Substantive Review: Traversing Taggart’s Rainbow was published in 2015 by Hart Publishing. A copy of the editors’ introduction can be downloaded here. Inspired by the work of Professor Michael Taggart, this collection of essays from across the common law world is concerned with two separate but related themes. First, to what extent and by what means should review on substantive grounds such as unreasonableness be expanded and intensified? In their contributions to the volume, Sir Jeffrey Jowell (Bingham Centre for the Rule of Law and Emeritus Professor, University College London), Jason Varuhas (University of Cambridge/University of New South Wales) and I agree with Taggart that proportionality should not “sweep the rainbow”, but propose different schemes for organizing and conceptualizing substantive review. Meanwhile, Matthew Groves (Monash University), Greg Weeks (University of New South Wales) and Cora Hoexter (University of the Witwatersrand, Johannesburg) evaluate the state of substantive review in Australia and South Africa respectively.